FRAMINGHAM, Mass.--(BUSINESS WIRE)--Oct. 6, 2016-- Staples, Inc. (Nasdaq: SPLS), one of the world’s largest internet retailers, today announced the availability of Apple Pay on its mobile website, m.staples.com, providing customers with an easy, secure and private way to pay that’s fast and convenient. Staples has announced the availability of Apple Pay on its mobile website, m.staples.com, providing customers with an easy, secure and private way to pay that’s fast and convenient. (Graphic: Business Wire). Staples business customers have already been using Apple Pay for purchases within the Staples iPhone app and in Staples’ stores. Now users visiting Staples’ mobile website with Safari will have the ability to check out using Apple Pay with just a finger on Touch ID, with no need to manually fill out lengthy account forms or repeatedly type in shipping and billing information. Security and privacy is at the core of Apple Pay. When customers use a credit or debit card with Apple Pay, the actual card numbers are not stored on the device, or on Apple servers. Instead, a unique Device Account Number is assigned, encrypted and securely stored in the Secure Element on the device. Each transaction is authorized with a one-time unique dynamic security code. 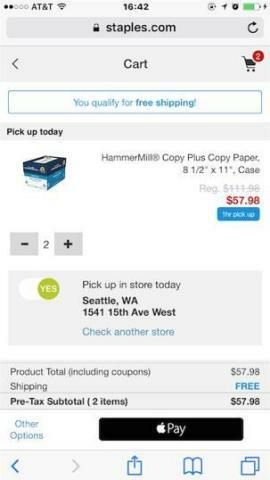 In Staples’ stores, Apple Pay works with iPhone 6 and later and Apple Watch. When paying for goods and services on the go within the Staples’ App or on Staples’ mobile website, Apple Pay works with iPhone 6 and later, iPad Pro, iPad Air 2, and iPad mini 3 and later. Apple Pay in Safari also lets customers use Apple Pay on any Mac introduced in or after 2012 running macOS Sierra and confirm the payment with iPhone 6 or later or Apple Watch. Staples also offers Apple Pay within Makr, a proprietary iPhone and iPad app that enables people to design and print one-of-a-kind materials. Staples Business Advantage, the business-to-business division of Staples, Inc., helps mid-market, commercial and enterprise-sized customers make more happen by offering a curated assortment of products and services combined with deep expertise, best-in-class customer service, competitive pricing and state-of-the art e-commerce site. Staples Business Advantage is the one-source solution for all things businesses need to succeed, including office supplies, facilities cleaning and maintenance, breakroom snacks and beverages, technology, furniture, interior design and Print & Marketing Services. Headquartered outside of Boston, Staples, Inc. operates throughout North and South America, Europe, Asia, Australia and New Zealand. More information about Staples (NASDAQ: SPLS) is available at www.staples.com.